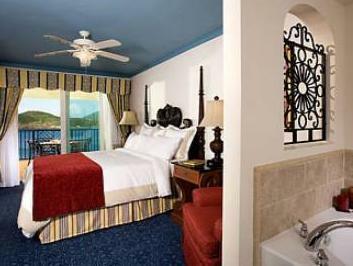 ﻿ Best Price on Marriott's Frenchman's Cove in Saint Thomas + Reviews! This Saint Thomas hotel has a private beach on Pacquereau Bay and is just over one mile from Havensight Mall. It features spacious villas with a balcony and view of the ocean. A full kitchen, living room and dining room are furnished in every 2 or 3-bedroom villa at Marriott’s Frenchman’s Cove. All modern villas include 32-inch LCD TVs, multiple bathrooms and a washing machine/dryer. Free access to 2 outdoor pools, a water slide and a hot tub is provided to all guests at the Frenchman’s Cove Marriott. A sauna and a state-of-the-art fitness center are also available. Sunset Cove Poolside Bar and Grill serves American cuisine and cocktails in a casual, open-air setting with views of the ocean. For snacks and freshly brewed coffee, the MarketPlace is open daily. Parking is free at the Marriott. Cyril E King Airport is a 13-minute drive from the hotel. Mahogany Run Golf Course is 6 miles away. Guests can find historic Hassel Island across the water from this property and Mangrove Lagoon within 5 miles of the property. Please be advised this resort will be undergoing renovation activities during the months of August to December 2019. Reconstruction activity should be expected. Guests are required to show a photo ID and credit card upon check-in. Please note that all Special Requests are subject to availability and additional charges may apply.